Wellington Movers – Moving is never easy, but it doesn’t have to be stressful. At Discount South Florida Movers, we have been helping people in Florida with all of their moving needs for over a decade. We have all the tools and experience to make your move run smoothly. We offer very low rates as well, without any sacrifice to service. Get your free quote today and see how low our prices are. Whatever your needs are, we can accommodate you. Our professionals can handle any residential or commercial office move. If you need your items packed securely or want them taken to our storage facility let us know. Rest assured we can move your piano or other delicate specialty item without damaging or denting them in any way. Let us take the stress out of your moving experience. Wellington is the fifth largest municipality in Palm Beach county and the largest village in the state of Florida. The village started off as a strawberry patch in an area called Flying Cow Ranch. The ranches owner bought much of the surrounding swampland and developed it. It was approved as a planned unit development by the county in 1972. The village has since grown to 60,000 sitting on 45 square miles of land. The area is known to be an equestrian community and they put on numerous equestrian events including riding, jumping, and hunting. It is also host to the Winter Equestrian Festival, the longest running horse show in the world. In addition to horse related attractions, there are numerous parks to visit. 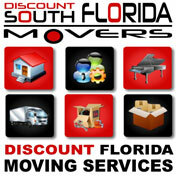 Discount South Florida and Wellington movers provide low rates on residential, commercial, piano and long distance moving.